I am pretty sure this is a simple thing but, for the life of me, it's driving me crazy! 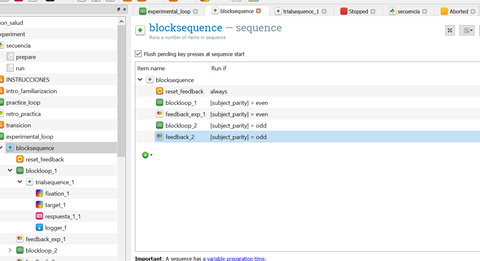 I am trying to do condition assignment with the participant number (subject_parity), so one set of participants sees one sequence (blockloop1) and the other group sees a different sequence (blockloop2). It all works very well with odd numbers but not with even numbers. If I change the order, the error switches to the even numbers, so I know it has something to do with the evaluation order of the variable. Does anybody know why this would happen? any suggestions? When I try the even numbers, it gives me the error message x should be int or float, not z but this does not make sense to me since subject_parity type is unicode. I tried defining it in an inline script, using a not(odd), and all sort of silly variations that don't work. subject_parity Is 'odd' if subject_nr is odd and 'even' if subject_nr is even. Useful for counterbalancing. Have you tried [subject_parity] == 'odd' ? Thank you!!! Sorry for the late reply, your first suggestion worked perfectly!